On the face of it, Justhost may not look like the most impressive web hosting company on the block. A quick look at their website reveals a basic, bare-bones design that is a far cry from the bells-and-whistles approach adopted by industry leaders like GoDaddy, HostGator, and iPage. However, looking closer -much as we’ll do in today’s review- reveals that the company’s no-frills, Keep-it-Simple style plays a large part in their success. Unlike those aforementioned hosts, you won’t find a plethora of extra services, add-ons and upgrades with Justhost, nor will you find pages boasting of their popularity with customers. Instead, the brand focus on giving customers like you and me just what we need from a quality web hosting company. Nothing more, nothing less. Below, I’ll share my experiences of using the company’s shared hosting plans, weighing up the pros and cons to help you make an informed decision as to whether Justhost are right for you. First things first, I have to say that Justhost’s opening sales page is a little bit misleading. At time of writing, the company were promoting unlimited disk space and bandwidth for £2.73 per month, which automatically made me think that I’d struck upon an absolute bargain. On further inspection however, it seems that the £2.73 per month deal only entitles you to 50GB of storage for one single website. Anyone looking for completely unmetered disk space will actually need to pay the higher-priced Pro plan, which comes in at £10.32 for a first term and £16.56 thereafter. Though not exactly the epitome of honest sales tactics, I have to say that 50GB for a single website still makes Basic a pretty sweet deal, especially with the regular renewal price being only £5.52 per month. What’s included in the basic plan? Along with aforementioned storage and unlimited bandwidth allocations, Justhost’s Basic shared hosting plan also offers five domain-based email accounts with a maximum of 100MB storage per account. Whilst I think this package is a great deal for small businesses who may only need a small website but with another room to grow, I’m actually going to recommend their second-tier Plus plan for those with bigger needs. At a first-term rate of £4.80 per month (renews at £7.59), this is competitively priced with similar plans offered by the likes of HostGator, and though it’s far from perfect, I do think it’s the better value-for-money package out of the two. What’s included in the Plus plan? Unmetered bandwidth is still present here, but your storage allowance increases to 150GB for up to ten websites. You’ll also benefit from 100 email accounts with 500MB per account. From here on in, it’s the Plus package that I’ll be focussing on throughout this review, though I will recommend other options where I think they’re more suited to a particular need. All of Justhost’s shared hosting plans come with the industry-standard one year’s free domain name registration. After that term expires, you’ll be expected to pay £11.04 per year. This is the one area where I don’t think the company are at their best in terms of price, as many other companies offer lower renewal rates, even on .com domains. Also in keeping with industry practices, if you decide to cancel your account, domain registration fees aren’t included in the organisation’s 30 day money-back guarantee. You’ll have to pay the £11.04 fee to cover their costs of registering your domain, but this does mean that you’ll be able to keep your domain and take it to another hosting company should you choose to. Justhost aren’t particularly generous when it comes to sub and parked domains, offering just 20 of the former and 50 of the latter with their Plus plan. The only way to get more is if you upgrade to the £10.32 pro plan, which removes any restrictions on either. Many other hosts typically offer more than this, especially in terms of subdomains, but this is a small grumble as I’m not convinced that users signing up to a plan like this one are going to be creating the kind of vast online empires that require more than 50 subdomains anyway. Justhost don’t exactly set the world on fire when it comes to offering customers an easy way to launch a website, but they’re certainly no more difficult than other companies that I’ve ranked highly for ease of use, such as FatCow, iPage, and SiteGround. The brand’s stripped-back approach and minimal upselling takes the hassle and complications out of choosing a package and paying for it. This is always a nice touch, offering a much quicker sign-up process than those companies who tend to make you jump through hoops and navigate through a myriad of options before you can access your account. Once you’re up and registered, you’ll be managing your Linux based hosting account* with cPanel. This is the industry-leading hosting management tool which presents the full range of tools and services at your disposal in a clear, well laid-out visual interface. Justhost’s customised cPanel may look a little ugly compared to sleek, polished skins used by other top companies, but much like the rest of their site, what lies behind the less-than-impressive design is solid, simple, and provides a service that is just as good -if not better in some cases- than any web hosting company on the market. In fact, I’d go so far as to say that the company’s child-like cPanel branding and layout actually offers an easier time than some of the more advanced versions, with a helpful navigation menu across the top and colour-coded icons divided into all the usual categories. 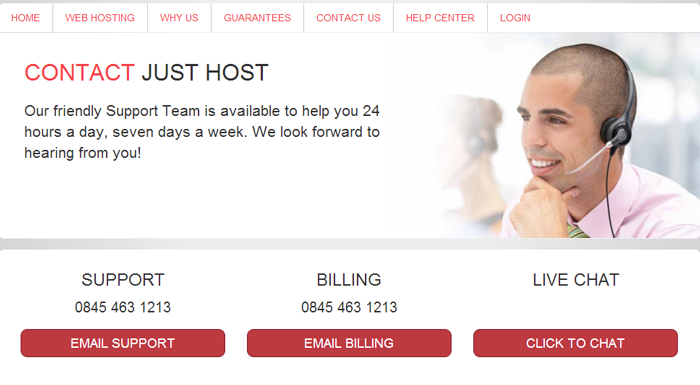 For newcomers and those with limited web hosting experience, Justhost is definitely a company I’d recommend. * From what I understand, Justhost don’t offer Windows hosting servers an option. Justhost are pretty vague when it comes to their guarantees of solid, reliable hosting, only promising that they’re “committed to providing a secure hosting environment” with round-the clock monitoring. Despite offering no indication of the kind of uptime you can expect from them, I can say from personal experience that the company do a decent job on the whole of making sure that websites are available and performing at their best 24/7. As you’ll see in the usual UK Web Host uptime monitoring chart to the right of this review, the company consistently good, although hardly ever great. That’s pretty much par for the course with Justhost. Most of what they do is solid without being spectacular. They don’t really offer anything that you can’t find elsewhere with another leading web host, yet do just enough to remain a viable and reliable option for anyone with basic web hosting needs. For me, the sign of a truly good web hosting company is about more than just the quality of the hardware behind the scenes, it’s about how well they do in helping customers at all levels of experience and ability to develop a web presence that works for them. In that regard, I’m more than happy to offer Justhost top marks as they do offer a wealth of options which cater for both beginners and advanced users, and of course, everyone in between. I’ve said elsewhere that there isn’t much Justhost offer that you can’t get elsewhere, and for the most part that’s true. Free access to a drag-and-drop website editor is available with other services like iPage and SiteGround, but Justhost are one of the few big-name companies out there that incorporate industry-leading web editor Weebly into their core package. At at time when a good number of companies charge separate fees for website building packages that leave a lot to be desired, free use of Weebly certainly makes Justhost a very attractive option for those who prefer to create sites using a quick, simple, WYSIWYG (What You See Is What You Get) editor. With Justhost, you can use Weebly to create upto six pages using over 100+ professionally designed templates of a quality that far surprases most other website building tools. If you need a little bit more than this, you can pay around £5 per month to upgrade for unlimited pages, password protected pages, and custom themes. For small, basic websites, the free version of Weebly that comes with Justhost is a great deal. If you are thinking of upgrading however, you might want to check Weebly.com first, as you may well save money by using the platform directly than paying for a Weebly Pro plan on top of the cost of your web hosting. No good web host worth its salt should attempt to attract customers without offering quick and easy installation of the three major Content Management Systems; WordPress, Joomla, and Drupal. Justhost, like many of its cPanel-based rivals provides one-click deployment of those three, plus many more. Wikis, Moodle sites, forums, bulletin boards and social networking sites are among the 70+ applications and tools that can be launched instantly through Mojo Marketplace. Whilst WordPress aficionados and beginner-level website owners are well catered for by Justhost, the company don’t disappoint when it comes to the needs of developers and more advanced users. CGI scripts, Ruby on Rails, PHP, Perl, Python and SSH (Secure Shell) access are all included, along with hotlink protection tools, Server Side Includes, cron jobs, and log files. Overall, a well-balanced package with something for everyone, and that’s before we even get to eCommerce. Let’s do that now, shall we? At first glance, Justhost seem to be one of the few hosting providers out there that still include a marketing bundle in with their shared hosting packages. Yet, as is usually the case with their sales pitch, all isn’t quite what it seems. Though the company promote free paid search advertising credits for Google and the Yahoo!/Bing network, a little investigation reveals that these are only available to customers in the United States and Canada. Whilst this is disappointing for those of us in the UK, I wouldn’t suggest making the lack of marketing credits a determining factor when it comes to choosing your next web host, as this is pretty much in keeping with other big name brands. That being said, the lack of advanced encryption, not to mention disk space restrictions don’t exactly make either package a great option for creating a safe, secure, and powerful online store. 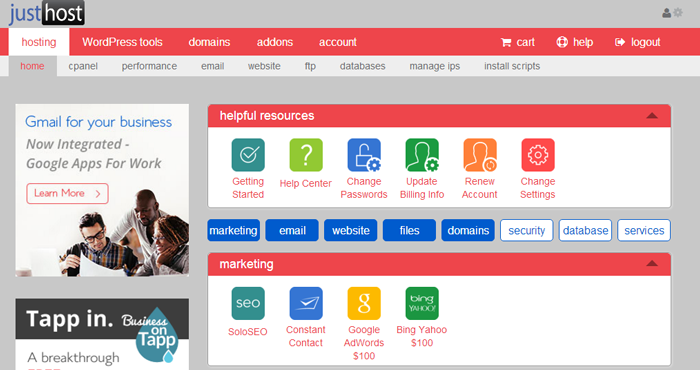 What I will say however, is that Justhost’s Pro package is a particularly impressive deal for those looking to launch an eCommerce site on shared web hosting. That’s only for starters. Justhost Pro is one of the few shared hosting deals I’ve come across which include a dedicated IP address and SSL certificate as part of the cost. Both tools are essential for ensuring that sensitive data that customers send to you through your site when they place an order or make an enquiry is fully encrypted and secure. Most other hosts will charge you a premium rate (I’ve seen anywhere from £30 to £400 per year) to add these tools to your hosting plan, so I’m confident in saying that Pro does offer outstanding value for money in this particular instance. Like most of their core service, Justhost’s customer support is good without being great. The three usual channels of support (live chat, email/ticket system, telephone) are all available as options. All three provide reasonably fast response times, with -unsurprisingly- live chat being the fasted way I’ve found to get access to support. On the whole, I found the support agents to be friendly and helpful in their Plain English approach to solving issues. The knowledge base and help files, does offer simple step-y-step instructions for solving most common tasks, though if you’re anything like me you may find the tutorials and advice guides difficult to read due to the very ugly -and boy, do I mean ugly- design. Sure, the company as a whole don’t exactly stand out from the crowd, but they do offer a reliable and reasonably priced alternative to some of the bigger name brands out there. The addition of a Weebly website builder plus the simplicity of the control panel makes this one very suitable for those launching a website for the first time, whilst the cost-effective Pro Plan stands out as one of the better shared hosting options for eCommerce websites. If you’re looking for a solid all rounder then JustHost is a great option.